This upscale enclave on the southeast rim of Mission Valley is picturesque, with attractive (and pricey) Spanish-styled homes for upwardly mobile yuppies. It's a peaceful pocket amid the hubbub of the inner city. There's a tiny business district along the single main artery, Adams Avenue. 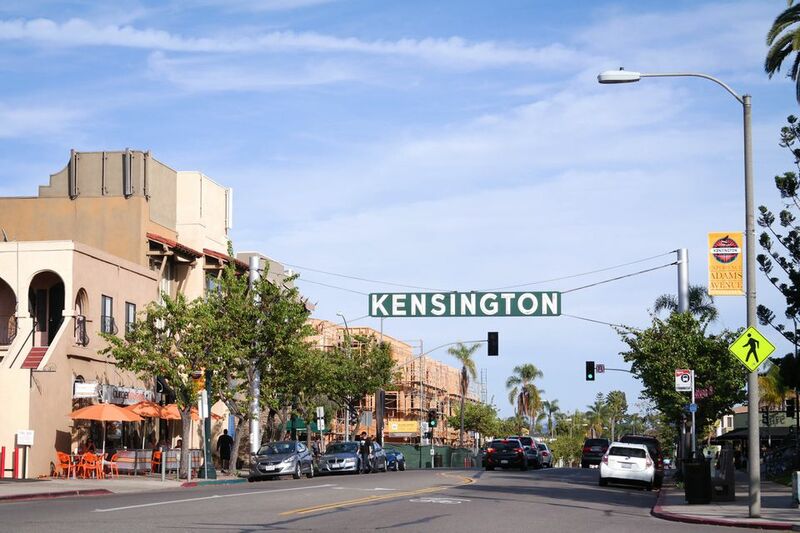 Known for its distinct California Spanish-style single family homes, Kensington was developed by real estate developers in 1926. The subdivision consists of 115 acres overlooking Mission Valley. The Davis Baker Company of Pasadena developed much of the original homes. Famous local architect Richard Requa, who was associated with Davis Baker, brought his distinctive California architectural theme, which had Mediterranean influences. The original homes and the quiet, winding streets. The Spanish tiled cottage style homes and their immaculate lawns also make the neighborhood stand out. Kensington is one of the three mid-city urban neighborhoods that whose main thoroughfare is Adams Avenue. It is at the eastern end of the strip that begins with University Heights at the western end, with Normal Heights in-between. Of the older urban neighborhoods in San Diego, it is one of the most desirable to live in. Like its fellow 'hoods, it is distinguished by the classic neon "Kensington" sign that spans Adams Avenue. You must go to Ponce's for Mexican food. It's been around forever (actually since 1969) at the corner of Terrace Drive and Adams Avenue, serving up no-frills Mexican food at good prices. Local favorite the Kensington Grill offers a hip and stylish setting. The Kensington Club is the place for drinks in Kensington. This venerable, old-school neighborhood haunt is one of San Diego's favorite dive bars. By day, it's a dark and mellow place to chill. At night, it livens up the quiet 'hood with live bands and DJs spinning music. For unique entertainment, there's the art house Ken Cinema, one of the last single-screen movie venues in the county. It's an excellent place to see classic, short and foreign flicks. Really not much except for your neighborhood storefront essentials: banks, dry cleaners, coffee house, liquor store, real estate office, travel agency. And the classic Kensington Video store, where you can find everything you can't at Blockbuster. From I-8, take SR-15 south and take the Adams Avenue exit. Go east on Adams and Kensington begins just after the SR-15 overpass. It's hard to miss the big Kensington sign. The neighborhood's eastern boundary is generally considered Van Dyke Avenue. Meade Avenue is considered the southern boundary, where there is more of a mixture of bungalow homes and apartment complexes. The core Kensington, though, is acknowledged as from Adams Avenue north.